I am excited to let all my clients know that we will be opening our new cruise office in George Town, Grand Cayman on 1 June. We will be situated on North Church Street, easy to reach from the Rayal Watler terminal. We will have lovely accommodation for our cruise brides to get dressed. This has been a very busy season for us, but we are determined to keep our services small, intimate and personalised. I will still be officiating only one cruise wedding /renewal per day. Despite our increase in operating costs I will hold the 2009 prices for those clients who are booking now for 2010. Once you have paid the $200 deposit to book your date and time, I will email you a copy of one of my ceremonies so that we can work to personalise your special event. For my resident clients, please note our office hours are 9am - 3pm Monday - Friday, after hours by appointment. You can request all the appropriate forms for us by email, and we will be posting Banns of Marriage at our new office. As many of you know, I am a Notary Public and a Justice of the Peace, as well as a Civil Registrar of Marriages/Marriage Officer. Our new office will make all these services more accessible to our clients. 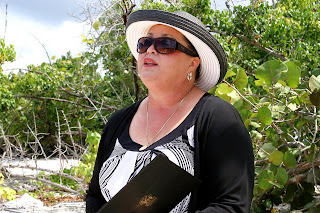 I have been a wedding planner and marriage celebrant for almost 16 years. 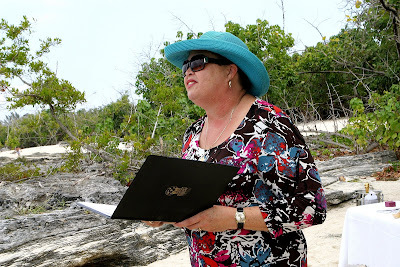 I specialise in intimate beach weddings for cruise visitors. In Grand Cayman there is no residency requirement for visitors, and you can be married while your cruise ship is in port. 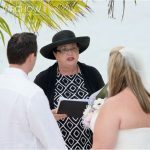 I also conduct wedding vow renewal ceremonies, and if you have been married less than two years, Wedding Blessing ceremonies. I do many Unity Sand Ceremonies creating a unique and memorable experience for your family in your own Memory Vase. The Unity Sand Ceremony can include your children, blended families, parents, as well as the Bride and Groom. As I write I am thinking of a special Unity Sand Ceremony which will include sand for a couple's yet unborn child. What a special way to let your future family know how much he/she was in your thoughts on your wedding day! let me tailor a package to your likes and your wallet. You will find no hidden charges. 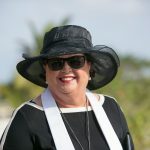 I am a member of the Association for Wedding Professionals International and work to their code of ethics. 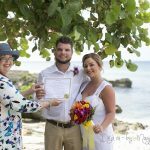 Call or email me today for an application form or to explore whether a Destination Wedding in the Cayman Islands is the right choice for you. Call +1 (345) 5256551 0r +1 (345) 9269933 or email mywedding@candw.ky. We provide all services for your wedding from our own trusted, professional vendors. 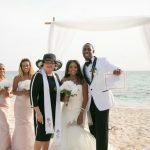 Let your destination wedding in the Cayman Islands be as special as your relationship, call or email the Joy of Weddings, Cayman Islands, today.